On your expedition to our menagerie, you will find an assortment of Fabergé animals. These hardstone carvings do more than mimic nature, but capture the personalities of individual animals. Fabergé applied this attention to detail to a number of hardstone animal portraits, most notably his famous commission from King Edward in 1907 to replicate all of the domestic and farmyard animals of the British royal family’s Sandringham estate. 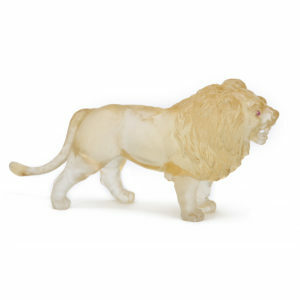 Wax models were made from life, amounting to more than a hundred different figures. Fabergé received many commissions for portraits of adored domestic pets, his clientele appreciating such commitment to accuracy. Fabergé’s lapidary studio broke away from the dry realism of traditional hardstone carvings, remaining loyal to detail but imbuing his creatures with whimsical charm. First, a wax model was made. Then, stones were selected based one what best conformed to a particular animal’s characteristics and sculptor-stonecarvers carefully noted poses and often exaggerated certain features. A reputation for this sort of attention to detail significantly distinguished Fabergé from his competitors. Fabergé’s animal creations were quite representative of the animal kingdom, comprising domestic and farm animals, wild creatures, and insects and reptiles. You’ll find a selection here, in Animals As Art: Wearable and Collectible.